An electric water heater doesn't have an exhaust flue at the top, and costs the most to run. Triple H Home Efficiency Experts expertly replaces hot water heaters. If you are looking to replace your old water heater with an energy-efficient model, you can rest assured that by choosing the experts at Triple H Home Efficiency Experts, you are getting the most cost-effective solution for your home. We also install tankless hot water heaters for a greater level of energy efficiency. We proudly offer water heater work in and around Brookhaven, Islip, Huntington and all neighboring areas. Contact us today for a free estimate! Did you know that your water heater can account for an astounding 15% of your home's total energy usage? Water heating is the second largest energy expense in a home. If you have an old water heater, you could be paying hundreds of dollars more than necessary annually. By taking advantage of new water heating technologies, you can reduce your monthly utility bill and stop worrying about running out of hot water or having your old water heater spring a leak. We are a home energy services company with the expertise to solve water heating problems in New York. Call or contact us online for a free water heater inspection and estimate to discover whether replacing your water heater makes the most sense. If you have a tank-type hot water heater that's more than 10 years old, wasting energy isn't your only concern. Older tank-type water heaters corrode from the inside and eventually begin to seep water. Beneath a solid-looking exterior, the inner wall of an older tank can be badly corroded. If you're lucky, you'll notice a small leak in time to have a new water heater, such as a tankless water heater, installed. If not, extensive water damage is a possibility. Capacity: Choose a gallon capacity to accommodate the needs of your family. Recovery rate: Find out how fast heat is transferred to the water. Size: Be sure that the new water heater will fit in the space that you have. Consider installing a tankless water heater to save on space. Standby loss: Ask about the percentage of heat loss per hour from stored water. If you want to learn more about how different water heaters work and what your options are when replacing an old water heater, we can help. The five different types of water heaters are listed below. Click on the type you're interested in to learn more. 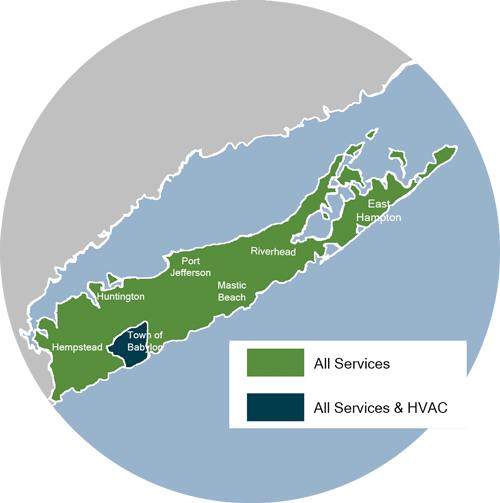 Call the experts at Triple H Home Efficiency Experts or contact us online to schedule a free water heater estimate in Brookhaven, Islip, Huntington, Smithtown, Huntington Station, Bay Shore, Brentwood, West Babylon, Ronkonkoma, Central Islip and nearby. For a complete analysis of your home's energy performance, schedule a home energy audit. Our custom audit will tell you which home energy improvements are right for your home, including water heater replacement and more. A tank-type water heater (aka storage water heater) is the most common type of water heater used in the U.S., but not necessarily the best. 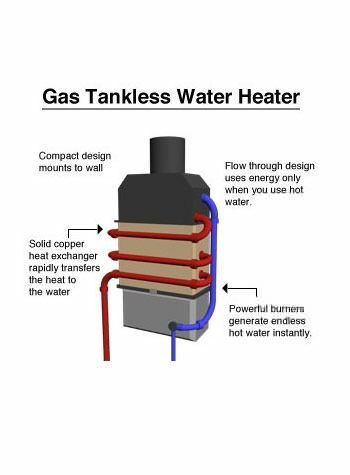 Tank-type water heaters use electric resistance elements, gas or oil as the heat source. An electric tank-type water heater doesn't have a burner or flue like gas and oil versions, and cost the most to operate. In fact, you can save up to $50 a month by getting rid of an electric water heater in favor of a more efficient one. Tank-type water heaters come in different sizes. A 60-gal. or 80-gal tank is adequate for most households. New ENERGY STAR tank-type water heaters are insulated to improve energy efficiency by reducing standby heat loss. Even with ample insulation, efficiency is limited because when the water in the tank eventually cools to a preset temperature, it must be reheated. Standby heat loss causes this cycle to repeat 24/7, whether you're using hot water or not, and whether you're at home or away. If your water heater feels warm to the touch, it's losing more energy and costing more money than it should. When the burner shuts off, the heat in the water is released up the flue too - so exterior tank insulation can't fix the problem of the water cooling again, requiring constant reheating. Interested in saving energy costs by eliminating standby heat loss? Then you may want to have a tankless or demand water heater installed. 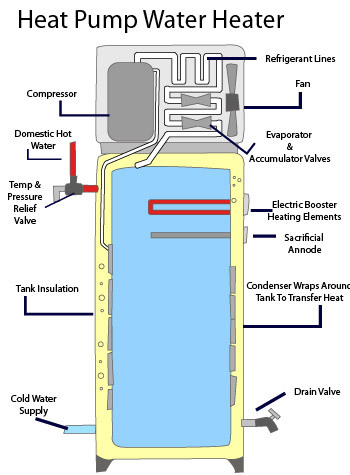 A heat pump water heater also qualifies as a tank-type water heater, but it works in a different way. Instead of utilizing gas, oil or electric resistance as a heat source, this appliance gets its heat from a small air-source heat pump located on the top of the tank. Like other heat pumps, this one uses a refrigerant to extract heat from the surrounding air and move it to a heat exchanger, where water heating takes place. 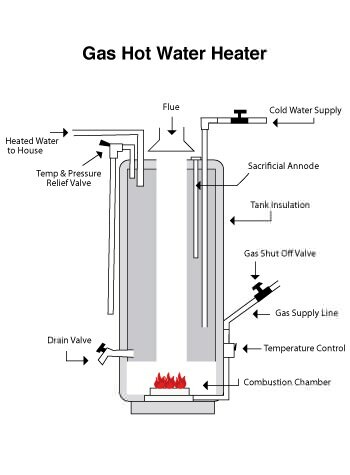 If necessary, regular electric resistance heating elements in the tank can provide backup heating. 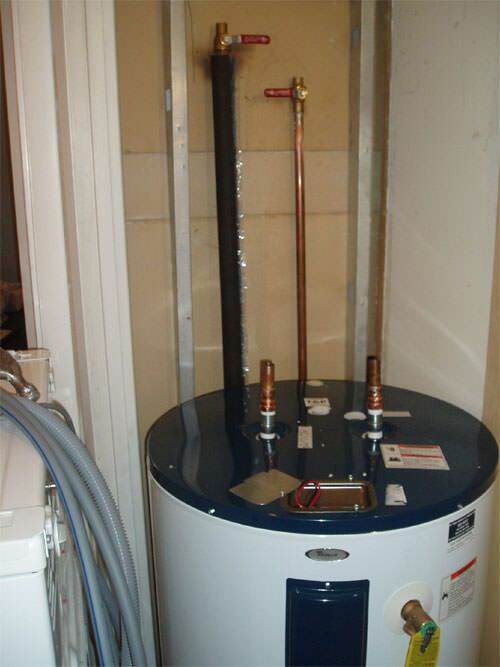 A heat pump water heater is about twice as efficient as a standard electric water heater. However, it will cool the space where it's installed, so it may not be suitable for use in cold climates where basements and utility rooms need to be kept reasonably warm. An indirect water heater gets its heat indirectly, from the furnace, boiler or heat pump whose main job is to heat the home's living space. In an immersed coil installation, there will be a hot water tank that contains a coil-type heat exchanger that is "fed" by the furnace, boiler or heat pump. 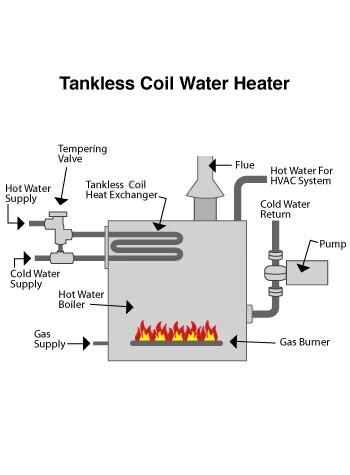 In a tankless coil installation, the water-heating coil is located inside the furnace or boiler, eliminating the need for a hot water storage tank. An indirect water heater can be very efficient, especially during winter months when the furnace or boiler is running anyway. But it's important to remember that the efficiency of this water heater is affected by the efficiency of the attached heating appliance. Tankless water heaters (aka demand water heaters) are becoming more and more popular because of how energy efficient they are. Unlike a tank-style heater that consumes energy heating and re-heating water, a tankless heater only heats water once, when a hot water tap is opened. Standby heat loss is eliminated. Case studies have demonstrated that replacing an old tank-type water heater with a tankless model can cut water heating expenses by as much as 45%. Tankless heaters fueled by natural gas and propane are more efficient than electric models. Tankless water heaters offer another advantage: They are very compact. A house-size model is about the size of a suitcase, and can be mounted on the wall. Most gas-fired models are direct-vent appliances, which means that they don't require a chimney. Instead, exhaust gas is vented outside through a pipe that extends through the wall. If you are interested in saving money on water heating by installing a tankless water heater, talk with Triple H Home Efficiency Experts about this upgrade. A solar water heating system won't eliminate the need for a separate water heater, but it can meet as much as 80% of a home's water-heating needs, so savings can be significant. This type of system is often referred to as "solar thermal." 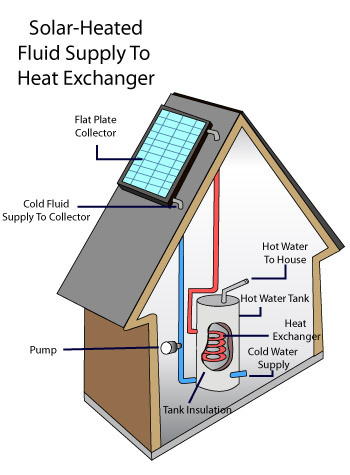 The most common type of solar thermal system is a closed-loop system like the one shown in the drawing. An antifreeze solution circulates between a solar collector and a heat exchanger located in a tank-type water heater. When the antifreeze in the collector reaches a certain temperature, it is pumped through the heat exchanger to heat the water in the tank. When solar heat is limited or unavailable, electric heating elements take over. A solar water heating system is a fairly expensive upgrade, but it can be worthwhile if you have good solar exposure and if you plan to stay in your house for the next 8-10 years or so. The sun's energy is free, and Triple H Home Efficiency Experts can install a solar thermal system that performs well and requires very little maintenance.